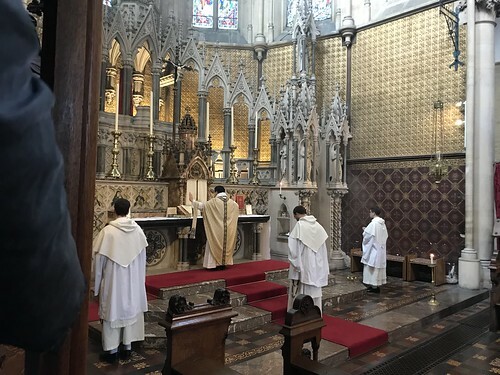 I was privileged to sing at a beautiful Dominican Rite Mass in London last Saturday, which opened a 'Retreat' organised by the New Evangelisation Committee of the Catholic Medical Association: Joseph Nunan indefatigable team. The Mass was sponsored by the Latin Mass Society. St Dominic's, Haverstock Hill, now a Shrine to the Rosary, is a magnificent church. Mass was celebrated by Fr Lawrence Lew OP. The Dominican chants were extremely interesting and not all that straightforward, despite their close relationship with those of the Roman Rite for the feast of the day: St Cyril of Alexandria. The Schola Abelis of Oxford (or small part thereof) was led by Dominic Bevan. Thank you to everyone who attended the CMA Youth Day-Retreat on Saturday 9th Feb at the Rosary Shine at St Dominic's Priory, Haverstock Hill, London. About 100 young people attended. It was a prayer-filled day, starting with Mass celebrated in the traditional Dominican Rite. The Mass is the source and summit of the Christian life, and essential for those of us who work in healthcare. Friar Philomeno, from the Franciscan Friars in Gosport, kicked off the talks with an inspirational introduction to the life and work of Fr Patrick Peyton and his Rosary Crusades. Then we heard a powerful story from one of our Catholic nurses, who, with her family, cared for and prayed for her dying father. After processing round the beautiful Rosary Shrine side chapels reciting the Joyful Mysteries, we had some light refreshment, then went straight into the final two talks of the day: on what it is to be a Catholic man and a Catholic women. Thank you to all who came and all who helped. Thanks be to God for His abundant blessings. We hope to put on a similar retreat-type day on a yearly basis for the youth of the CMA, for ongoing spiritual nourishment! Photos and talks hopefully to follow. ...Have you said your Rosary today? I'm very happy to publicise this event. 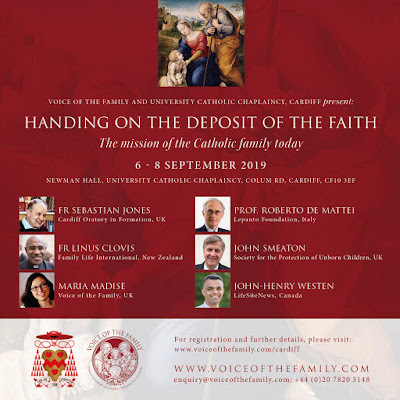 You are warmly invited to a joint conference of Voice of the Family and University Catholic Chaplaincy, Cardiff that will be held on 6-8 September 2019. 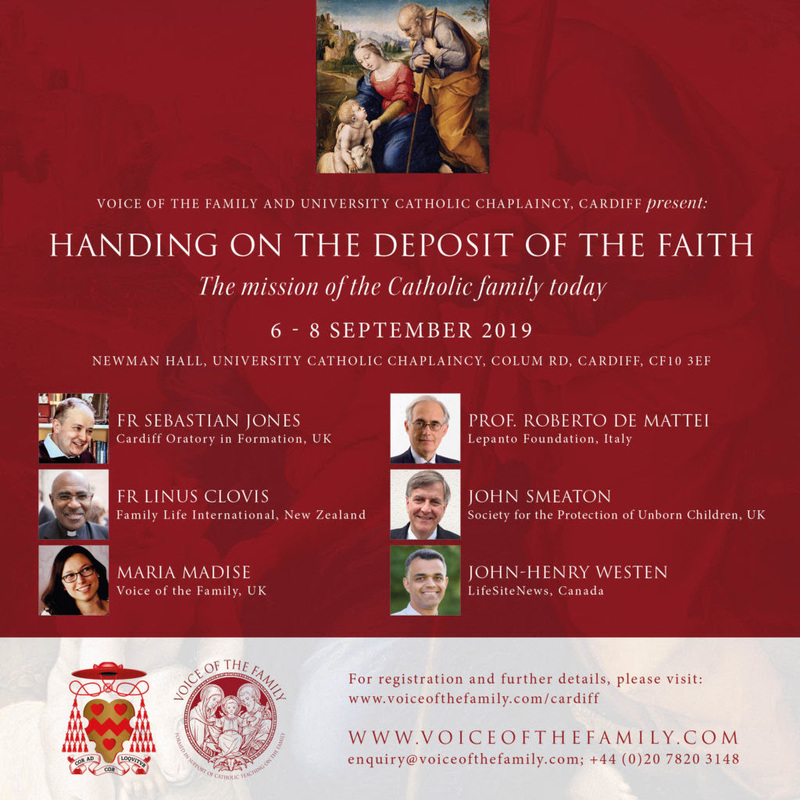 This conference is open to all who are concerned with safeguarding the deposit of our faith in our families and in society. Apart from discussing the particular threats to the family and ways to counter these threats, it will be an opportunity to meet fellow Catholics and to forge a fellowship that will strengthen us as individuals and families at this turbulent time. The conference will take place on the weekend when we celebrate the birthday of Our Lady, under whose motherly care we entrust this gathering and our families. Let us pray for the Triumph of Her Immaculate Heart, while we endeavour to make an ever-stronger commitment to pass on the faith in our families and in the world today. The conference will run from Friday afternoon until Sunday lunch time. Sunday: Solemn High Mass in honour of the Nativity of Our Lady, followed by brunch. I'm happy to pass on the news of this event to anyone who might be interested. You can sign up at their Eventbrite page. This is a chance to experience RCA UK first hand - you can meet the RCA UK Tutors and Board, hear from two Directors from RCA in the US and a priest from our chaplaincy, the Fraternity of St. Peter, and see the layout, books and uniform. 2:30 pm Mrs. Kari Beckman and Mrs. Collette Balmer: Regina Caeli in the U.S. - Classical Education in a Hybrid Academy. 3:15pm Fr. 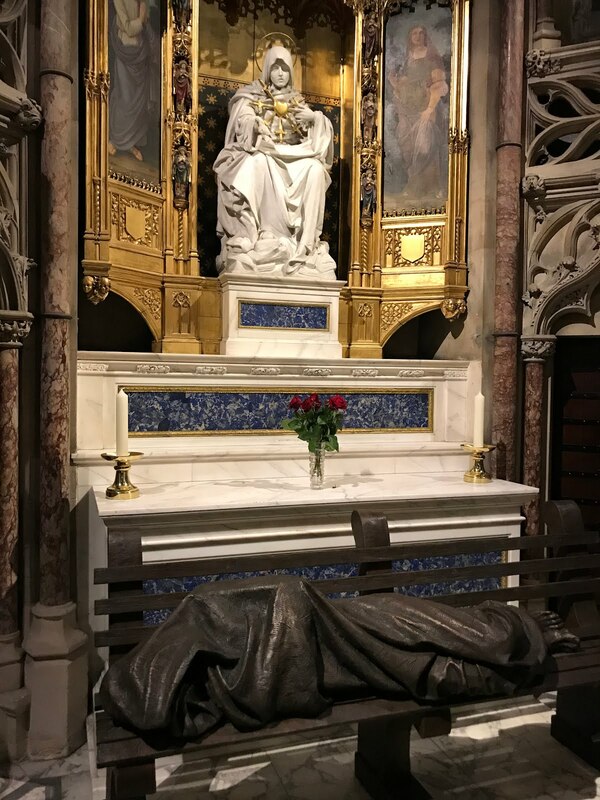 Patrick O'Donohue, FSSP: RCA and the mission of Catholic Education in the U.K.
Our Lady of Sorrows, appearing to gesticulate in horror at the sculpture deposited in her chapel. The famous Jesuit Church, the Immaculate Conception, Farm Street, in London, is richly decorated, and boasts many exquisite side-chapels. One can imagine Lady Julia Flyte popping in to one of them to pray before her chat with her Jesuit spiritual director in Brideshead Revisited, as many Catholics must have done over the Church’s 150 years of use. In one of these, dedicated to Our Lady of Sorrows, I found, on a recent visit, a life-size park bench rendered in bronze, and on it, an equally brazen blanket covering a sleeping figure. This “Homeless Jesus” sculpture, of which there are copies in cities around the world, has found its way there because Westminster Council refused permission for it to be installed near London’s Houses of Parliament. Whatever one thinks about this object as a sculpture, a striking fact about its current London home, where it has now been blessed by the Nuncio, is that it makes it impossible for Mass to be celebrated in this chapel. It suggests that the Jesuits of Farm Street have no idea what to do with their side chapels. They are not alone. If they are not simply neglected, one finds them in many churches cluttered with information displays or used for storage. Almost nowhere are they used for Mass. Why, one might ask, were they built in the first place? To make possible the celebration of private Masses simultaneously by different priests. This would naturally happen in a church served by several priests, when two or more of them did not have a public Mass to say on a given day. They will, obviously, wish to celebrate Mass, and may well wish to do so at the same time, say before breakfast. That would be natural, wouldn’t it? That was the old way, but priests’ attitudes to the celebration of Mass underwent a revolution after the Second Vatican Council. Since 1967, to be exact, priests living together have been encouraged to ‘concelebrate’: say Mass together. The practice of priests of ten centuries, during the time that private, ‘low’, Masses have existed, of celebrating their own Mass each day, was in this way set aside for something entirely new: of priests, not with their bishop but amongst themselves, acting as simultaneous celebrants of one celebration. This is an example, and sadly not the worst, of the liturgical rupture which followed the Second Vatican Council. 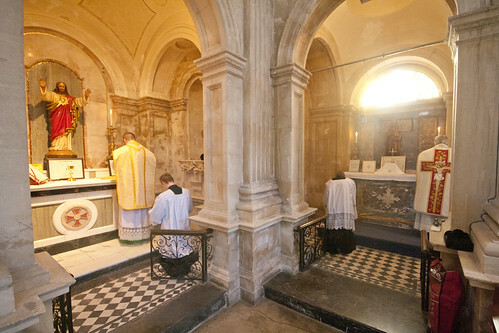 When several priests concelebrate Mass, only one Mass is celebrated; when we are told that this is officially preferable to three or more Masses being celebrated, it is not surprising that many priests have inferred that in the absence of pastoral need there is little to be lost by not celebrating Mass at all. Pope Benedict XVI found it necessary, therefore, in his 2007 Post-Synodal Exhortation Sacramentum Caritatis (80), to remind priests that daily celebration of Mass (to which they are not bound by the Church’s law), is a good idea, even in the absence of the Faithful, since “it fosters the priest’s configuration to Christ and strengthens him in his vocation”. This would be the case with concelebration as well as with private Masses, but other points indicate the advantage of a priest celebrating on his own, notably ‘the objectively infinite value of every celebration’, and ‘the Mass’s unique spiritual fruitfulness’. 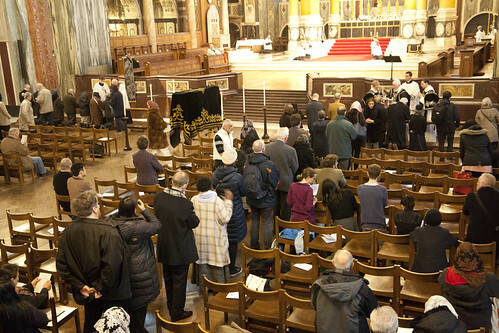 Mass is celebrated for the living and the dead, in union with the whole Church: it is not something of significance only for those who happen to be present. Two Masses for an intention are better than one, just as two Rosaries, said with equal fervor, are better than one. It is not just a matter of a Mass’s infinite intrinsic value as the re-presentation of the Sacrifice of Calvary, but of its finite extrinsic value: the value contributed by the appropriateness of the prayers, the holiness of the priest, and so on. 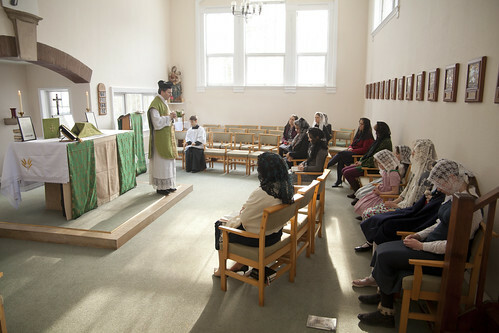 Although these considerations apply to Masses celebrated without the Faithful, the traditional practice in reality had pastoral advantages as well, in creating a supply of short early morning Masses for those wishing to attend before the day’s work, and in creating a demand for altar servers which led to many vocations. 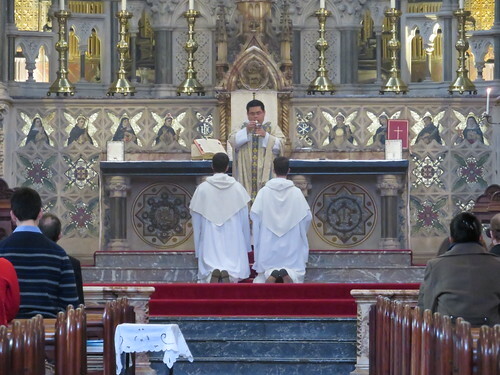 I have had the privilege of seeing multiple Masses in progress at side altars, at the Priest Training Conferences organized by the Latin Mass Society in England. It is a truly edifying sight, a glimpse of the reality of the ceaseless prayer rising up from Masses being celebrated all over the globe. Where priests live together, in larger parishes, in seminaries, clergy residences, and other institutions, it is time that the clutter was removed from side chapels for them to function once more as their builders intended, for the good of the priests, and for the living and the dead. 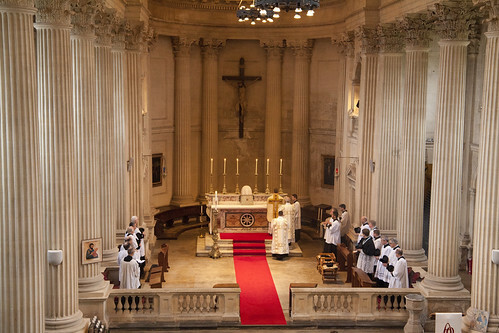 Low Masses at Prior Park during the Latin Mass Society's Priest Training Conference. A reminder that there will be a training day for servers at St Mary Moorfields in London this Saturday, 16th, with enrollments into our Servers' sodality, the Society of St Tarcisius. The day starts at 10:30am and should conclude by 4:30pm. All the details are here, including about the next two training days later in the spring: 9th March and 11th May. Email tarcisius@lms.org.uk if you want to attend. 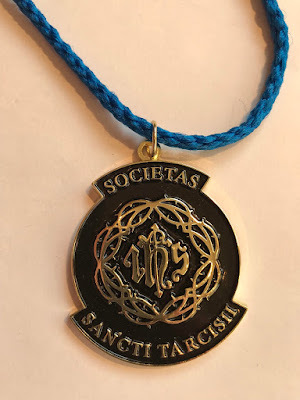 I'm delighted to say that the medals we commissioned for the Society of St Tarcisius have arrived, which makes enrollments possible. And they look great. We will be using different coloured cords to indicate ranks in the Society. Naturally we had in mind the precedent set by the venerable Confraternity of St Stephen with their distinctive servers' medal: although ours is quite different in design, it is a comparable size. 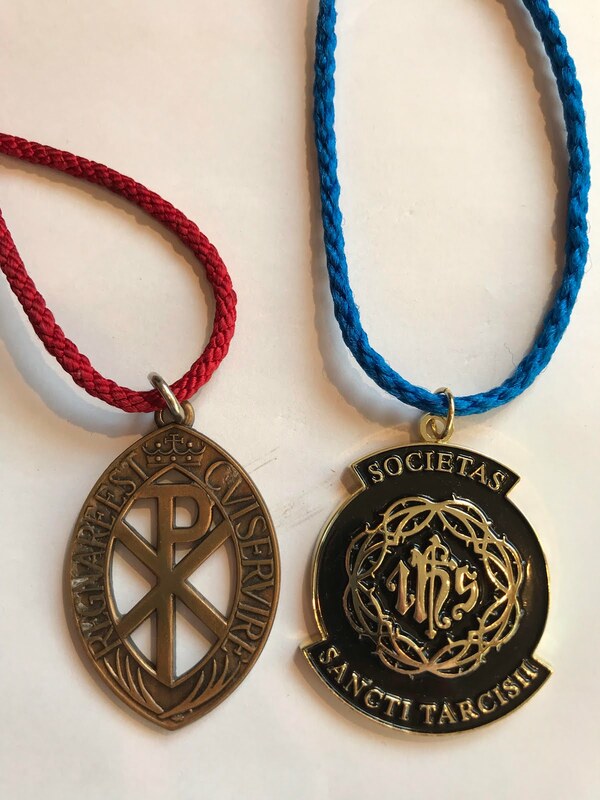 I was shocked to discover, recently, examples of the Confraternity medal made of plastic in a local sacristy. Is this a new thing? The example I have (left behind at last year's Summer School and not reclaimed), is at least made of metal. 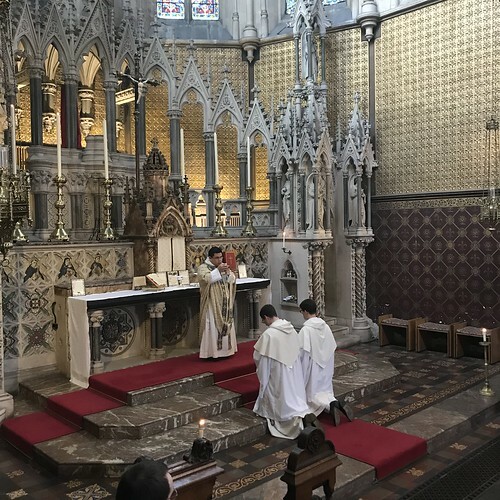 In any case, the Society of St Tarcisius, while inspired by the original ideals of the Confraternity, is exclusively committed to the Traditional Latin Mass, and the service of the Altar by boys and men. On Saturday, and at future training events, a priest (in this case Fr Gabriel Diaz) will bless medals and officiate at the service of enrollment. A lot of the acrimonious debate about Amoris Laetitia boils down to the question of Catholics in a state of grave sin wishing to receive Holy Communion. Such difficulties are not new to the Church, which has long included unjust rulers, men who have mistresses, people enjoying the fruits of crime, and such like. Indeed, in one respect the situation was more difficult in past centuries, because more people voluntarily excluded themselves from receiving, to such an extent that in the High Middle Ages most lay Catholics only received Communion once a year, on Easter Sunday. So the question asked today was relevant: how can the Church both exclude Catholics in grave sin from Holy Communion, or foresee that they will exclude themselves, and still make them feel part of the Church’s liturgical life, a lifeline to the sinner who needs the grace of repentance? The answer is that the Church has found many ways of doing this, ways which are not, in general, employed today. It is instructive to consider them. The central point is a simple one: in past centuries, liturgical participation at Mass was not focused on the reception of Holy Communion. Catholics willingly attended Masses at which they would not receive, in order to ‘hear Mass’. Peasants went to early Masses before starting work. Nobles would have a priest celebrate Mass at an altar in their bedroom before breakfast. St Margaret of Scotland attended three Masses, one after the other, each morning. The complex ceremonial, the use of Latin and (if the Mass was sung) chant and other music, made it a deeply spiritual experience. What were they doing during these Masses? They were praying. They were uniting their prayers with those of the priest and of the Church. It was spiritual food for them. The high point of these Masses was the Consecration. As time went on the moment of Consecration was surrounded with greater ceremonial (such as raising the Host for people to see), and all kinds of architectural and musical techniques were employed to give it greater visibility, emphasis, and dignity. There were indulgences for those who witnessed the elevation and said a short prayer: ‘My Lord and my God’. Those who saw Christ in the elevation felt that they had done something important that day. Other things took place at a parish’s main Sunday Mass which further helped foster a sense of inclusion. 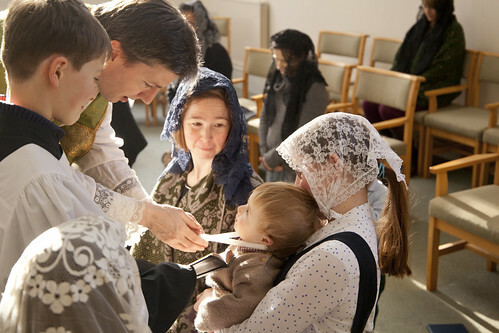 First, Mass began with the congregation being sprinkled with Holy Water (the ‘Asperges’). Then, in many places the people participated in the ‘Kiss of Peace’ by kissing a metal or wooden object, a ‘pax’, which was passed from the priest to the server and then to each member of the congregation. This symbolized the Peace of Christ spreading out from the Altar, and the Consecrated Host present upon it at that point in Mass. At the moment of the Priest’s Communion, people made a ‘Spiritual Communion’, a form of words summarizing their intense desire for Christ to enter their hearts. At the end of Mass ‘Blessed Bread’ was distributed in some regions of Europe, and sometimes ‘Absolution Wine’. These made particular sense of the practice of fasting before attending Mass, even if one were not to receive Communion, and were sacramentals. When Holy Communion was received by the whole community, in the Middle Ages, on Easter Sunday, those not receiving, whether villagers or kings, were shown up as sinners. This happened, however, only once a year: today, we have this problem every Sunday. In the past, when the faithful had began to receive Holy Communion more frequently, another practice developed which stopped the Communion line being such a public spectacle: Communion was given betweenMasses, or in private. Coupled with the practice of going to Communion monthly or fortnightly, after careful preparation, this made it impossible to tell if your neighbor was a regular communicant. This last practice ended in the inter-war period. The kissing of the ‘pax’ and the customs of ‘Blessed Bread’ and wine died out, for the most part, in the centuries after the Council of Trent. A final idea worth noting, however, is this. Missionaries in Africa in the 20th century faced the problem that many non-Christian men well-disposed to Catholicism were impeded in their conversion by the fact that they had multiple wives. One approach to the problem was to encourage them to make a promise to be baptized before they died. This placed them in a clearly demarcated ante-chamber of the Church, and there could be no doubt, if one fell seriously ill, that those looking after him could baptize him validly even if he lost consciousness. My purpose here is not to suggest that all these practice be revived, necessarily, but to point out that a little pastoral imagination could address the problems all acknowledge and which can otherwise look insuperable. clergy in choir a blueish tinge: a compromise 'colour balance' I adopted when processing the photo. Another week, another rather second-rate photograph given the full-page treatment in the Catholic Herald. 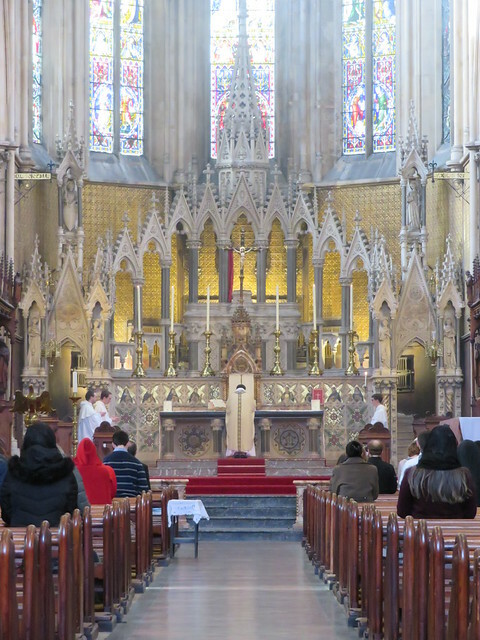 This time, as well as the poor lighting, the camera appears to have been focused on the altar (hardly visible in the gloom), whereas the brightly-lit reredos some distance behind it is out of focus. I'm sure a common response to my curmudgeonly comments will be that I should be more charitable to what is, presumably, an amateur photographer sending in a snap to the Catholic Herald for which he will not even be paid. This response, however, is part of the cult of mediocrity which has done huge damage to the Church, and should be ruthlessly uprooted wherever it is found. Naturally, small, charitable Catholic associations and impoverished parishes struggle to produce professional-looking publicity, or music; they struggle with the legal obligations imposed by data-processing, safeguarding, and employment law; they can't always answer the phone or process requests for documents as quickly as one would wish. The Latin Mass Society is in the same category. But let us not embrace a culture of incompetence, half-hardheartedness, and kindergarten artistic standards as if it were a good thing in itself. Let us at least continue the struggle against the difficulties inevitable to under-resourced organisations. And when there is a supposedly professional, commercial institution in our midst, like the shiny new magazine-format Catholic Herald, let us hold it to decent standards. Enough of this rubbish. I think most people can tell when a parish fails to rise to great heights of artistry through sheer lack of resources. The state of the building and nature of the parishioners will tell you enough. Such a situation, where poverty is matched with zeal, has made many Catholic artists want to contribute to community life at their own cost, as an act of charity. When artistic mediocrity is matched with pile carpets, expensive sound-systems and a well-heeled congregation, then you know that it is ideological. Here is the letter which the Catholic Herald declined to publish. In trying to be charitable, I cast the blame on the lighting in this particular case, but the fact is they should never have published the photograph I refer to. As a keen amateur photographer of churches and the liturgy (with more than 22,000 photographs on my Flickr account), I have been looking at your series of photographs of church interiors with increasing dismay. It is not entirely the photographers’ fault. The biggest problem has been poor lighting, but the latest offering displays, at the Lady Altar of St James’ Spanish Place in London (Jan 18), blue lilies. They might seem appropriate, but they are hardly credible. Parish priests who would like their churches to look good in photographs would do well to consider two principles. First, please don’t over-illuminate the sanctuary—or anything else—leaving the rest of the church shrouded in darkness. Second, please don’t mix yellow lights with white lights. It appears that the white cloak of the statue of Our Lady in the photograph you have reproduced is illuminated by a warm artificial spotlight, and the lilies are dimly lit with cool natural light: a photographer’s headache. Even worse, and entirely avoidable, are churches where yellow spotlights clash with white fluorescent lights. The problem is not nearly so obvious to naked human eyes—as Chesterton wrote, ‘Terrible crystal more incredible /Than all the things they see’—though poorly considered church illumination does nothing for the atmosphere. Sometimes the human eye and brain can be too clever by half. I once parked a yellow car for an evening in London, and set off home after dark in a white one. It took me some time to find it, but the number-plate was the same as mine and my key fitted the ignition. It was parked under a yellow street lamp, and where everything had a yellow tinge I was seeing ‘yellow’ as ‘white’. Today, entire bishops' Conferences appear to be telling people that living according to God’s law is impossible for Catholics in so-called irregular unions. I say ‘appear’ to be telling people this, but if they don’t really mean this, should they not then clear up the confusion? The answer to that question seems obvious enough. Less obvious, however, is the answer to the question: How did things come to this? How could it have come about that vast numbers of Catholics — from ordinary faithful to bishops, cardinals, and even the pope — should feel it possible, and apparently praiseworthy, to render systematically unclear, if not explicitly to deny, the seriousness of fundamental moral principles, like the Sixth Commandment – Thou shall not commit adultery? It has never been part of the Church’s teaching or pastoral practice to ignore the difficulties faced by sinners in changing their lives. Among the greatest saints, we find those who went through the most painful processes of conversion, such as St. Mary Magdalen, St. Mary of Egypt, and St. Augustine of Hippo: in modern times we find the example of Alessandro Serenelli, the murderer of St Maria Goretti, among many others. Humanly, what they did would seem impossible, but Christ tells us, speaking of the difficulties some have in reaching heaven: “With man this is impossible, but with God all things are possible” (Matthew 19:26). The Church exists, in fact, to make available the means which God has provided to make the impossible possible. What Christ was able to do for St. Mary Magdalen, to stimulate her repentance and to cleanse her from her sins, is available in the Church today. The hearts of sinners can be reached by the example of the saints, by grace flowing from the liturgy, by preaching, by means of sacramental confession and absolution. All of these are a means to cleansing the human heart of the heaviest sins and restore it to friendship with God. 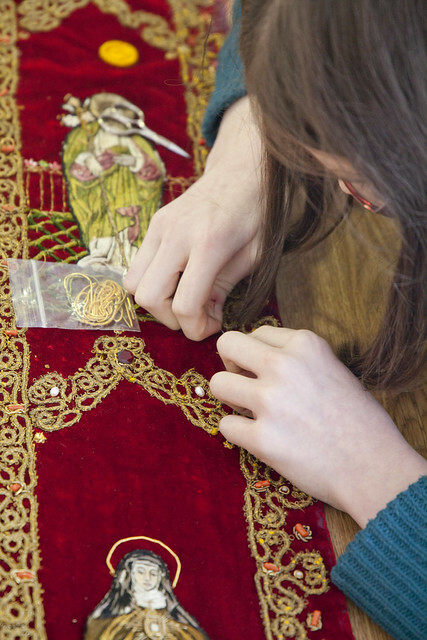 Cross-posted from the Guild of St Clare blog. This year's spring Guild of St Clare Sewing Retreat, like last year's, took place in the snow: last time it was the 'Beast from the East' in early March. By now we knew the route up Boars Hill which doesn't turn into a toboggan run for cars, so the disruption was manageable. I had even bought the car some 'snow socks' and other widgets for bad weather, which came in handy. The last day of the Retreat, Sunday, also happened to be St Blaise's feastday, and we had the Blessing of Throats. Lots of sewing was done, and various large projects for the Latin Mass Society and others were brought closer to completion. The Retreat was sold out--numbers are limited--and much edified by Fr Edward van den Burgh's spiritual conferences, Masses, and other devotions, and also by his joining in the sewing himself! He went home with advice on the repairs of one liturgical item he had brought with him and completed repairs on others. Many thanks to the Guild of St Clare for organising another successful retreat! Guild of St Clare Sewing Retreat, at Boars Hill, Oxford. I've written a fair amount on this topic on this blog; here is a piece I've done for LifeSiteNews. In a blog post on January 26, Fr. Michael White got himself into hot water by criticizing parents who bring their young children to Mass.